My obsession for riding dirt roads, and linking dotted lines on my well-thumbed map, is getting a little inconvenient – at least if I intend to make it down to Peru… I’ve struck a rich vein of backcountry potential here in the Ecuadorian Highlands, and it’s hard to leave stones unturned. 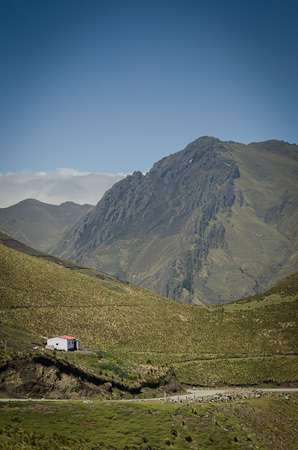 My original intention had been to drop down to Latacunga, and follow a dirt road to Baños running parallel to the Panamerican, before climbing back out towards Ambato and Volcan Chimborazo. 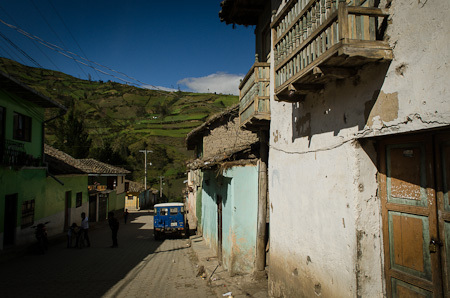 But when I heard about a backroute to Salinas – a stone’s throw from Chimborazo – I decided to return to Zumbahua and see if I could track it down. Although the popular IMTB map doesn’t show a way through, I was assured there was, via El Corazon – and it would all be on dirt. That was the theory. In practise, it was even better. There’s now also a ‘seasonal’ road, open to motorbikes (and bicycles of course) that peels off before El Corazon, running directly to Simiatug, close to Salinas. The good news is that this saves you plummeting down a further 700m in altitude – which would be fun, except for the 700m climb that comes in direct reply. Best of all, it’s completely traffic-free. From here, after a brief detour to Salinas (home to a famed chocolatier and cheesemaker), a 4200m dirt pass linked me with the paved Ambato-Guaranda road. I’d been told about a little travelled, cyclable trail that runs slap bang between mighty Volcan Chimborazo – famed for being the closest point to the sun – and it’s more humble cousin, the saw-toothed Volcan Carihuairazo. This in turn drops you out just a handful of paved kilometres from Riobamba, thus almost completely avoiding the Panamerican. 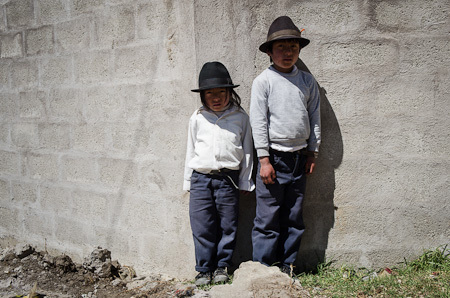 See Part 2 for details of the ride from Simiatug to Riobamba, via Chimborazo. 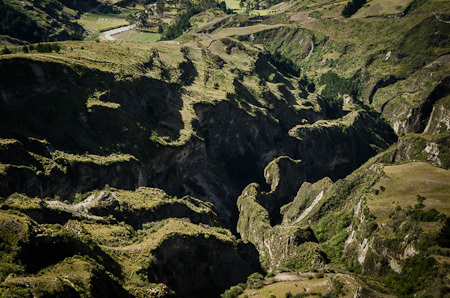 The half day hike teeters precariously around the crater lip, with views towards jigsaw-like canyons below. 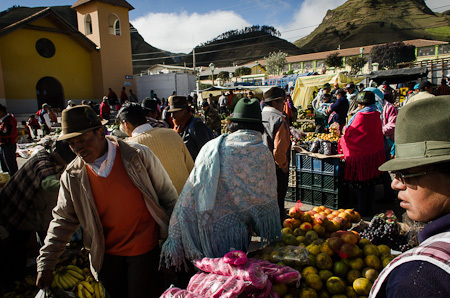 Zumbahua’s bustling Saturday market, up at 3800m, is a good ‘un. Then I was back on my own again. .
After a short sting on asphalt, an unpaved dirt road peeled off towards Angamarca, cresting a pass at over 4000m. Me, sporting my new $5 llama-wool scarf bought at the market. This proved to be a stunning, desolate stretch. 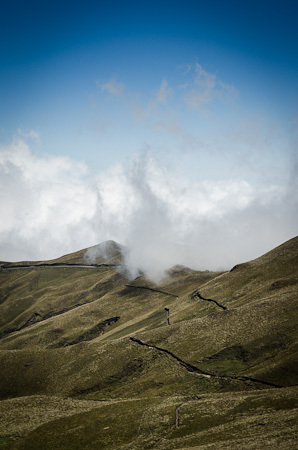 In the distance, a wall of lower altitude clouds barreled their way towards the interlocking valley. The terrain here was more open and barren than I’d experienced in the cultivated Quilatoa area. 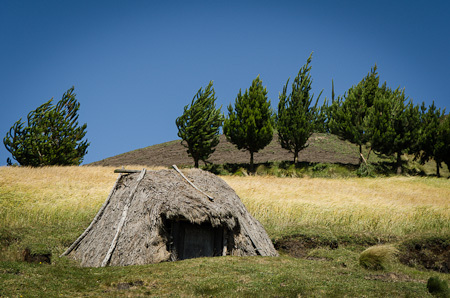 These traditional huts are cut directly into the ground, and earth used for their bricks. Their thatch rooves trap heat efficiently. Another potential travel partner. Sadly, not enough room in my panniers to scoop him up. 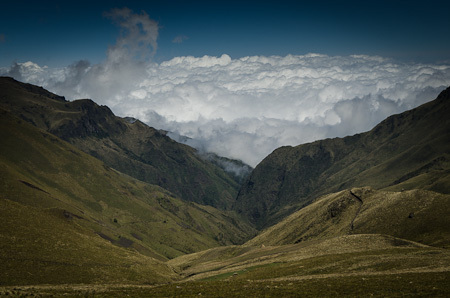 Far, far below, down at 2950m, lay the blip of Angamarca, set deep in the valley folds. 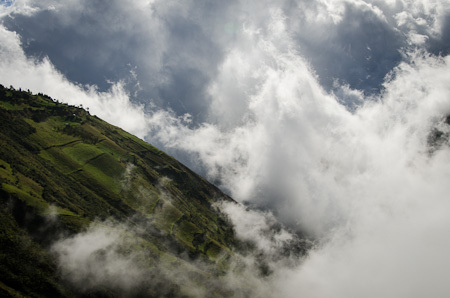 The Ecuadorian Andes drops away steeply at this point to the lower climes of the coast, creating all kinds of bizarre cloud formations. I stopped for a helping of ‘papas fritas’ – chips – and a couple of oranges. My arrival was met with some surprise. It seems tourists are far and few between. 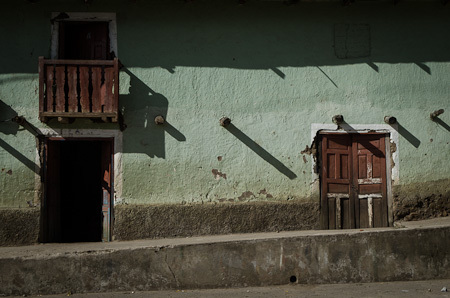 The backstreets of forgotten Angamarca. The road continued to descend, the vegetation changing with it. 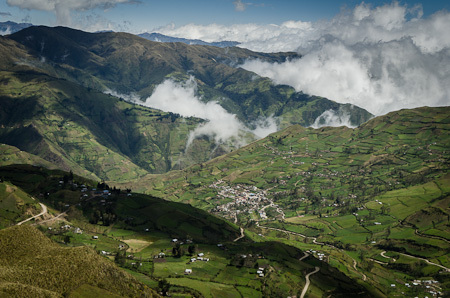 Backcountry Ecuador: a stunning land of rugged ups and downs. Before long, it was time to climb back once more. Clouds sweeping in from the coast enveloped the land. A real pea souper. And with them, conditions worsened. 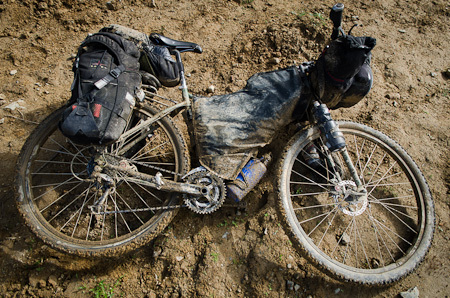 The well-packed dirt I’d been enjoying soon morphed into a tacky quagmire. Rain began to fall, it was getting dark, and camping potential wasn’t looking too enticing. 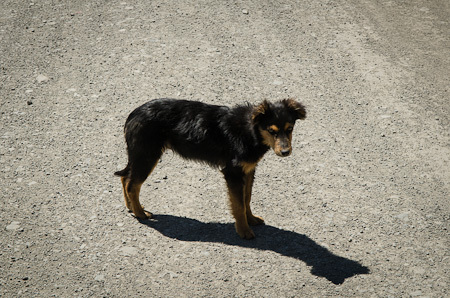 As night fell I took a wrong turn – which ended up being just as well, as it lead me to the tiny village of Quishpe – rather than the town of El Corazon, which I’d intended to reach that day. And in doing so, I discovered a new road that would allow me to bypass El Corazon entirely, saving a massive drop in altitude. 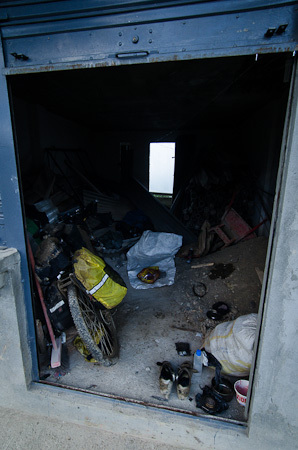 Asking around for a place to stay resulted in this grubby spot – at least it was dry, and a chance to air out sodden kit. Thankfully, things were looking more upbeat the next day. For the most part, the sun soon parched the road dry..
My trusty Ogre. Definitely in need of a good scrub behind the ears. Scott at Porcelain Rocket built me a cover for my framebag to keep out rain and muck. Works a treat. 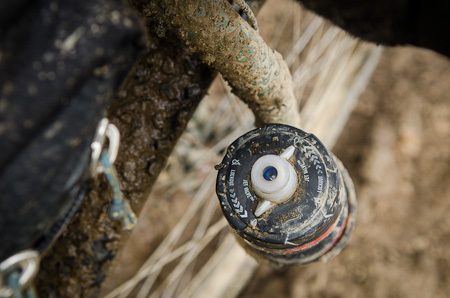 As does mounting 800ml water bottles to the Ogre’s fork blades — they’re easy to access, though prone to picking up muck. Profile Kages provide kung fu grip. My CST Caballeros are proving their worth on this terrain, even if they’re not the fasted rolling of tyres on pavement. 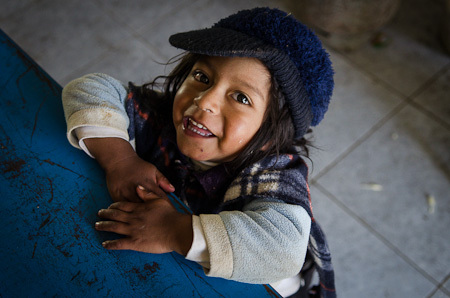 School break in Mindina – I was soon swamped by curious kids. Note the one checking spoke tension with his foot. The road zig zagged up and down continuously, a couple of hundred metres at a time. A few mini land slides meant ensured seasonal road is only open to motorbikes – of which I saw one all day. The hardest part was saved for the last 7km – I was down to my smallest gear, inching my way up towards Simiatug, chin to the handlebar. 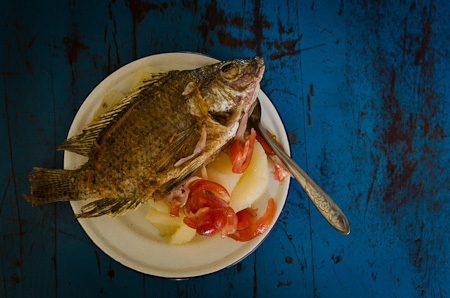 Where, finally, I was able to get myself some lunch – a $1 plate of fish, yucca and tomatoes in the market. 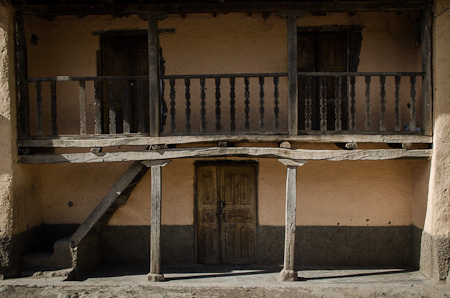 Set in the nook of a steep side valley, Simiatug boasts some fine, well worn architecture. Nice hats. 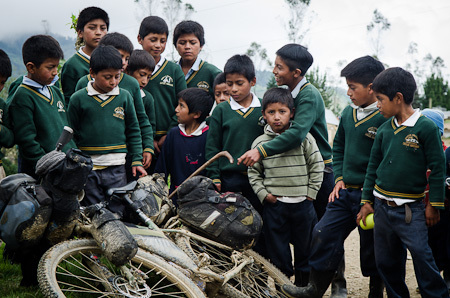 A puncture always draws some curious onlookers. Simiatug has a fledgling tourist infrastructure – one hotel, unexpectedly hidden on an upper floor of a government-style building. 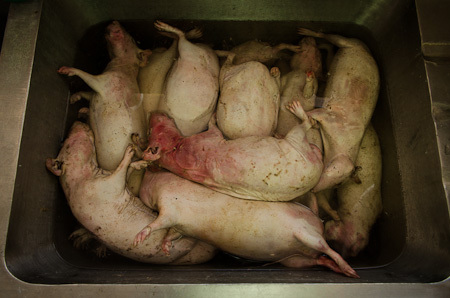 There, a dozen cuys were being prepared for a group arriving for a community workshop the next day. The view from the hotel. I settled into my $8 room, which included a bathroom, sporadic water and wifi! I was happy! 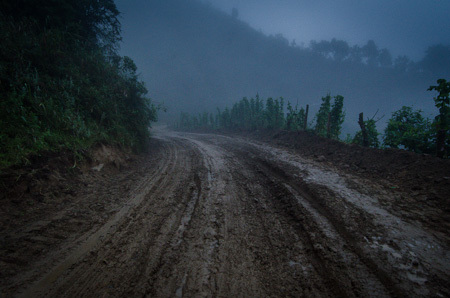 It’s around 100km from Quilatoa to Quishpe – 77km of that is dirt. 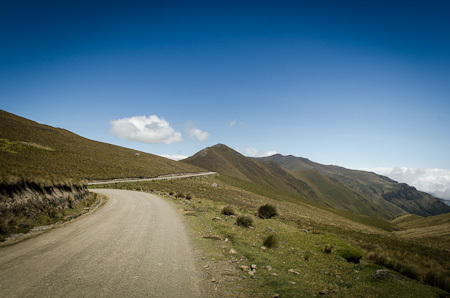 Follow the road out of Zumbahua towards Quevado, turning off onto dirt after a 10km paved climb. 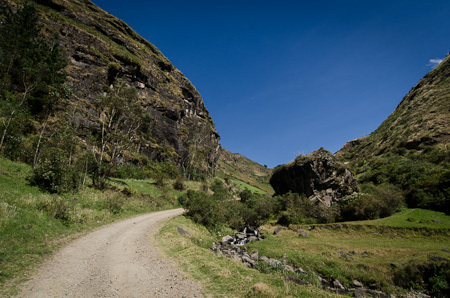 The road is signposted to Angamarca – Nida de Cordones – which lies at around 2950m. The highest point is 4100m, before dropping down to 3700m and climbing back up again. Finally a switchback descent leads you down to Angamarca. The occasional bus plies this route – it’s all perfect, well-compacted dirt. From there, the road drops a further 200m, before climbing back up again and then descending in earnest towards El Corazon, which lies at a lowly 1600m or so. Luckily, you can turn off towards Quichpe (2300m) shortly after Pinllopata – ask, as I got a bit lost. 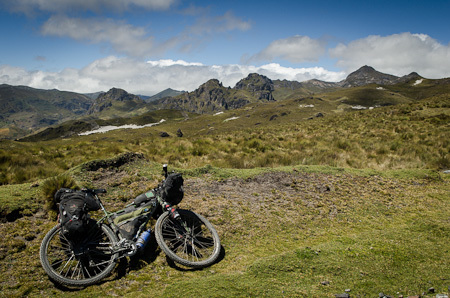 From Quishpe, it’s a challenging, at times muddy 38kms to Simiatug (3200m), via La Plancha and Mindina (2600m). 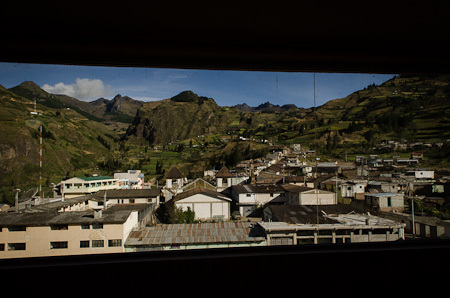 A hostel was almost finished when I passed through in Mindina. 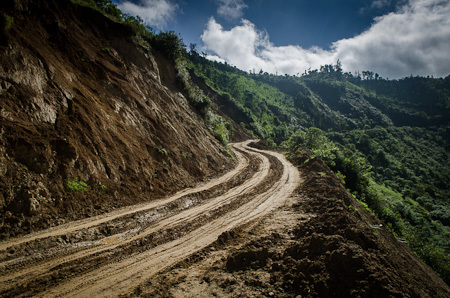 The last 7kms to Simiatug are particularly tough, finishing with a massive, unexpectedly steep climb. 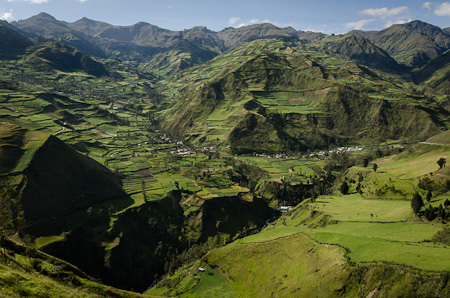 Simiatug is set within a beautiful valley. It has a restaurant, internet and a hotel. 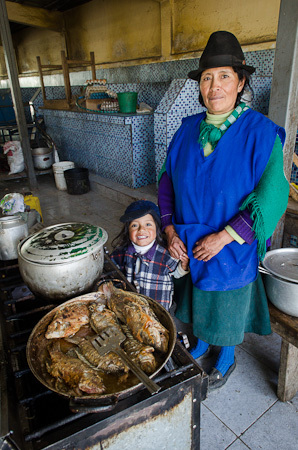 It’s really friendly too, and a lot less touristy then nearby Salinas. 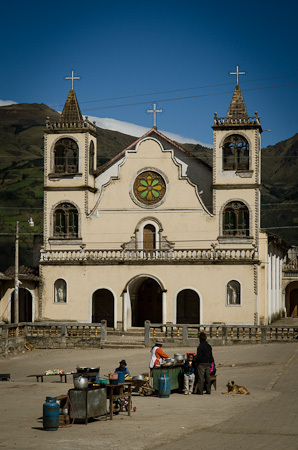 This entry was posted in Ecuador and tagged El Corazon, Quilotoa, Simiatug, Surly Ogre, Zumbahua on June 17, 2012 by Cass Gilbert. what an awesome detour, stunning details. 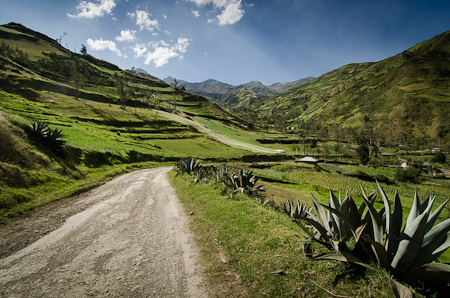 When/if you get to Banos, another fabulous route that i took was the road the runs along the base of Turunghua (sp! )to Riobamba. At the time the road was closed as it had been taken out by the volcano, but made for an excellent off the beaten track route -single track, wooden bridge crossings and no cars of course… the road may have been re-built though, was a good option then ,check it out. (nice there are a few options to avoid the Pan-Am!) Look foward to the next installment! Hi Cass, just a note to say thanks as always for tempting us onto this incredible route with your pics and route details – not sure we´d have tried it otherwise! 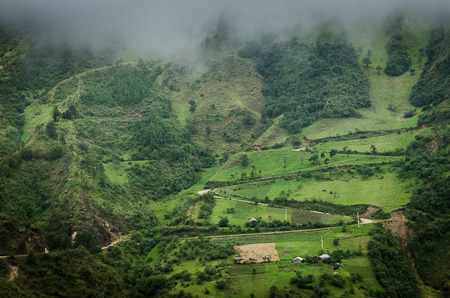 Suffice to say the route up from Quishpe is quite different in mid-rainy season – quagmires and landslides, but still passable with a bit of grunt work and well worth it. The final few km up to Simiatug nearly finished us off – now resting up and enjoying the market here. Love the new site by the way! Hi! Good looking route! I’m in zumbahua currently, but I think I’ll be sticking more to pavement as I head towards manta. I noticed you were using an alcohol stove, where did you have the best luck finding fuel? I can’t fins anything over 70% pure at pharmacies or super markets, a problem I never ran into in Chile or Argentina. Thanks! Not had any issues finding it here. I ask for alcohol pura or alcohol industrial. Either in hardware stores, or at the pharmacy (a bit more expensive). The last one I bought at the pharmacy was by a brand called Weir, in a white and red bottle. The hardware stores will often fill up your bottle. Hey thanks for the timely response. I’ll tty a ferreteria or weirs next time. I bought something I assumes was similar to weirs at a grocery last time, and was disappointed with its burn I.e. stopped burning with fuel still in the stove. Interesting aside, I just met a new hampshire-ite acquintaince of yours (Isiah I believe his name was) while taking a couple days off in canoa. Small world sometimes. Thanks again, perhaps we’ll cross paths when I’m back in the high country! oh – and paint shots are always a good bet too. The last one I went to charged $2.50 a litre – and was happy to fill up my 250ml bottle. 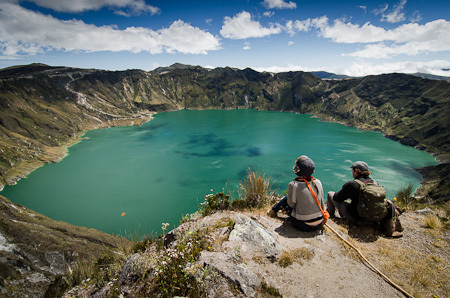 Headed to do this plus around Cotopaxi first week in January. I would like to get a good map in the states before I go. Looking for some good detail, perhaps topo. Any ideas? Otherwise I think I have to get one in Quito. Good maps are available in Quito – not sure about overseas. Otherwise, I just use the basemaps on my Gaia phone App. They’re pretty good. 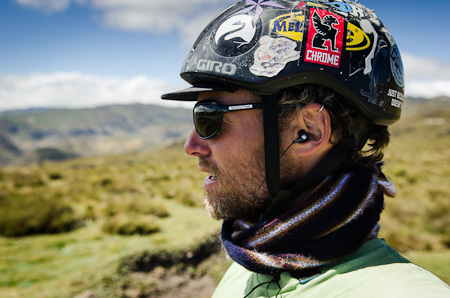 Garmin’s Ecuador maps are highly recommended by friends there.